Our Table oranges are premium quality, specially selected for their size and perfection. They come out in 15 kg boxes, for easy handling. They have a great amount of juice content, and their smooth pulp have great intense orange color which makes them very attractive. As all of our varieties, they have no seeds. We focus on harvesting them at their optimum sweetness and growth time. 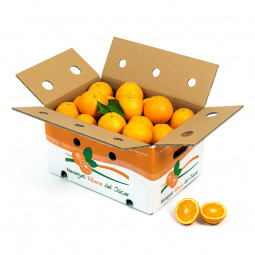 Our Table oranges are grown in Carcaixent, Valencia´s village known as "The Cradle of Oranges". Thanks to their taste and natural freshness, are capable of satisfying the most demanding gourmets. Oranges are a great source of vitamins and really healthy. Well appreciated for they high Vitamin C content, but not the only one. They also have Vitamin A, most of Vitamin B complex, Vitamin E and flavonoids. All these reinforces immunity system and cells tissues. Due to their High Phosphor content, they are good to keep memory as well. They have diuretic action, so helps purify liver and kidneys. Also great detox properties. We strictly supervise all process so that only the best of our extraordinary oranges, get to your table. Taste the difference! Delivery and VAT included prices.